Apply online ITBP application to ITBP Recruitment 2018 241 Constable. Indo-Tibetan Border Police (ITBP) Recruitment Board, latest notification for Constable. Applicants can get full advertisement below and submit the ITBP online application at www.itbpolice.nic.in. Applicants who are going to apply, ensure ITBP notification that you are eligible for post of Constable. The applicants will have to apply online, no other option. The last date of submitting online application is 31.01.2018. 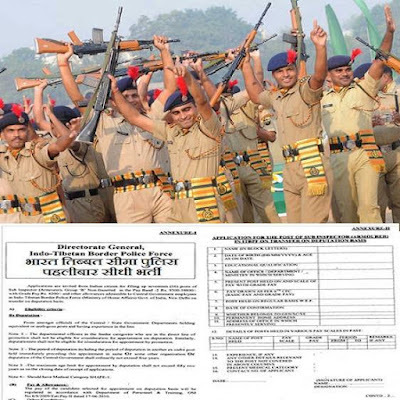 ITBP jobs notification further information such as eligibility criteria, syllabus and how to apply etc. listed below. Education qualification: 10th, 12th, Industrial Training Institute certificate in respective trade or its equivalent qualification from a recognized Board / University. Selection: Written Test, Physical Efficiency Test (PET) and Physical Standard Test (PST). (i) Before start of physical efficiency test (PET) and physical standard test (PST) the candidates will undergo thorough verification of identity including Bio metric capture. (ii) Bio metric identification of candidates can also be taken at any stage of recruitment. Payment of application fee can made through online payment gateway system on www.recruitment.itbpolice.nic.in. Application received with any other mode of fee payment will be summarily rejected. Candidates belonging to Scheduled Caste, Scheduled Tribe and Ex-servicemen are exempted from paying fee. How to apply: Eligible applicant require to apply online through ITBP Recruitment 2018 website www.itbpolice.nic.in from 31.01.2018. 1. Log on to the Indo-Tibetan Border Police (ITBP) website www.itbpolice.nic.in. 6. Make the payment by online payment gateway system on www.recruitment.itbpolice.nic.in. Application received with any other mode of fee payment will be summarily rejected. Candidates belonging to Scheduled Caste, Scheduled Tribe and Ex-servicemen are exempted from paying fee. Applicants have great chance to get jobs Indo-Tibetan Border Police (ITBP) Recruitment, however if someone want to ask anything please comment below.